SPBI, a public limited company with a share capital of 51,541,628€, registered with the Trade and Companies Register of La Roche-sur-Yon under the number 491 372 702. Its headquarters are located at: Business Park of l’Eraudière, 85170 DOMPIERRE SUR YON (France). Access and use of this website are subject to the following “General Conditions of Use,” detailed hereafter, as well as to applicable laws and/or regulations. Connection and access to the website, www.jeanneau.com, implies full acceptance without reserve by the user of all terms of the following General Conditions of Use, which he must consult with each connection. - Present the network of dealerships providing these products and services in locations around the world. Information gathered via the www.jeanneau.com website (subsequently referred to as “the Website”) is managed by SPBI S.A., responsible for data management, in order to process your request for information, and/or your request for subscription via the Website to the newsletter and services offered by the Website, as well as to better get to know you. This data management is based on the legitimate interest of SPBI S.A., within the framework of managing customer and prospective customer relationships. Information marked by an asterisk in the forms is required in order to process your request. Should you choose not to enter this information, your request cannot be completed. Your data is communicated internally within SPBI S.A. with customer services, au service marketing/sales services and communications services. With your prior consent, your data can also be communicated to other parts of the BENETEAU Group, as well as with distributors/ dealers who may make sales offers to you. 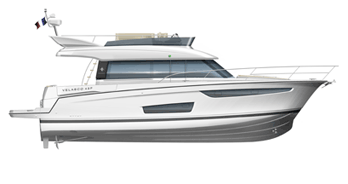 When these parts of the BENETEAU Group and/or concerned distributors/dealers are located outside of the European Union, standard contract clauses have been agreed upon between the concerned parties. Your data is also accessible to our subcontractors (notably for website hosting purposes). Please note that your personal data cannot be communicated to third parties other than for the purposes listed here without your consent. Subcontractors are acting under instructions from SPBI S.A, and are required to put appropriate protective measures into place to safeguard personal data. You can exercise these rights by writing to the following email address: service.client@jeanneau.fr. However, your opposition can, in certain cases, have an impact on, or make it impossible to complete, your request for information, registration or use of services provided by the Website. You also have the right to seek the assistance of a national supervisory authority, such as the National Commission for Data Protection and Liberties (CNIL-France), in the case of a violation of the applicable laws regarding personal data protection, and notably the European law n°2016-679. When visiting the current website, certain information relative to your navigation is subject to be saved in files, known as “Cookies,” located on your data terminal (computer, tablet, cell phone or any other device optimised for Internet use). This article will help you to understand what a cookie is, its role, and how to modify its parameters. These cookies are issued by SPBI S.A. in order to better meet your needs and expectations and to facilitate your navigation on the website. A cookie is a text file that, thanks to your browser software, is stored in a dedicated space on the hard drive of your terminal when you visit a website or an ad. It contains multiple pieces of information, notably the name of the server that issued it (server of the website that you visited), an identifier in the form of a unique number, and possibly, an expiration date for the said cookie. Cookies enable the sender to recognise the user terminal on which they are saved and to collect information relative to navigation on websites. - “Indispensable cookies” to the operation of this website: these enable the memorisation of information entered into forms, as well as managing and securing access to reserved spaces (enrolment or access to your account, service requested, contents of an order left in a shopping cart, etc.). - “Functional cookies:” these adapt the visual presentation of the website to the viewing preferences on your terminal (language used, image resolution, etc.) in order to personalise your visit to the website. - “Analytics cookies” (or cookies used for measuring website traffic): these gather anonymous information regarding website visits in order to establish statistics and volume of website traffic (number of visits, pages viewed...) and to better understand the visitor’s use of the elements that make up the present website (headings and pages visited…), allowing SPBI S.A. to monitor and improve the quality of its services. Furthermore, this site uses Google Analytics, a website analysis service provided by Google Inc. (“Google”) that allows us to analyse the use of the website by visitors. - “Social cookies:” these allow you to interact with social networking modules on the website (Facebook, Twitter…). You can control and manage the storing of these cookies on your terminal by setting or modifying the parameters of your browser software. Thus, it is possible to configure your navigator to accept or reject all cookies, either systematically, or according to their source. It is also possible for you to choose to be automatically informed when a cookie is saved to your terminal. Lastly, to benefit from greater control in managing cookies, you can configure your browser software such that the choice of whether to accept or refuse will be proposed before a cookie can be saved onto your hard drive by the server of a website that you are visiting. It is thus advised that you configure the parameters of your browser to suit your needs. As all browsers are different, you must consult the “Help” menu of your browser in order to learn how to modify your parameters related to cookies. As a user of the website, you acknowledge having the competence and technical means necessary to access and use this website. You acknowledge having verified that your computer configuration does not contain a virus, and that it is in perfect working order. You must also have read and understood the General Conditions of Use and agreed to respect the terms. You are solely and entirely responsible for your use of the website, www.jeanneau.com. SPBI S.A. cannot be held responsible for direct or indirect damages, such as, notably, damage to material, loss of data or programmes, or financial damage resulting from the use of this website or any linked websites. You agree, in your use of this website, www.jeanneau.com, not to undertake any manipulation susceptible to bring about functional or any other IT failures that might affect the operation of the website, or any server or service accessible via the website. You agree, notably, that within the space of the website, you will only leave information, data, documents, and/or files that are reliable, inoffensive and not susceptible to affect operation of the website or of any server or service accessible via the website. - not to damage the image of SPBI S.A. in any manner or form whatsoever. SPBI S.A. could not be held responsible for any damage resulting from access by a visitor to the website and/or use of the website, or for the inability to access the website. Article 6 – Limit of Liability of SPBI S.A.
SPBI S.A. has opened this website for the personal use of its visitors. Commercial exploitation, even partial, of the data presented on the website is prohibited without prior written consent by the company, SPBI S.A. The website offers a general presentation of the range of product lines and services of the JEANNEAU brand. As a result, SPBI S.A. cannot be held responsible for any inexactness and/or any omission of information on this website. The information presented on the website (text, graphics, photos, etc.…) are indicative, and thus purely for the purpose of providing general information. In spite of our vigilance, this website cannot be considered a contractual document and cannot form the basis of a judicial action. To obtain current, precise information, notably on pricing, availability, features, content, and variations of different products and services figuring on this website, we recommend that you visit the dealership of your choosing. Indeed, SPBI S.A. has entrusted the distribution of its products and services to a network of dealerships, independent retailers, who are solely able to furnish current and precise information on the features and pricing of the products and services that they offer. SPBI S.A. has a continual development policy for the products and services within its network and reserves the right to modify, without prior notice or public announcement, the relative information therein, and notably, information related to features and pricing of products presented, without being held liable. As SPBI S.A. cannot represent in whole or in part the product offer presented on this website, we recommend that you inform yourself at the dealership of your choosing to obtain additional and individualised information. The information appearing on the current website corresponds to the last online update of the various pages of the website. Some modifications could have taken place since the last update. This is why we recommend that you contact the dealership of your choosing to learn about the most recent product evolutions. SPBI S.A. cannot guarantee the accuracy and comprehensiveness of information updates to this website. The prices appearing on this website are indicative, in effect on the date of the last update of the various pages on the website: Price A2019. They are indicative public prices, and can change at any time without prior notice. These prices cannot in any case be considered contractual sales offers for products or services of SPBI S.A. or its dealer network, and cannot in any way be compulsory for the dealerships. In spite of the vigilance of SPBI S.A., it is possible that errors in price could appear on the website, for whatever reason (bug, data entry error, technical error...). These errors cannot serve in any way as cause for liability of SPBI S.A.
To obtain current and precise information, notably on pricing, availability and features, we recommend that you visit the dealership of your choosing. Indeed, the dealerships within our network independently define the prices of the products and services that they offer. Furthermore, all products and services appearing on this website are not necessarily available at each of our dealerships. We recommend that you visit one of our dealerships to learn more about product availability and services offered. The selection of a product on the current website does not serve in any way as a reservation for a potential sales order. Reservations can only be made at the dealership of your choosing. The current website is a work, of which SPBI S.A. is the author, according to articles L 111.1 and the Code of Intellectual Property. The creation of the current website are the product of Génération Internet (www.generation-net.org/fr/). The texts, photography, animation, drawings, sound and other works are the exclusive property of SPBI S.A.
Any reproduction, direct or indirect, provisory or permanent, by any means and in any form, in whole or in part, as well as any representation, use or modification, even partial, of the current website is strictly prohibited. This would constitute the crime of plagiarism, punishable by three years imprisonment and a 300,000€ fine (Intellectual Property Code, article L 716-10). The nominative and semi-figurative brands of JEANNEAU are registered by SPBI S.A. and are the exclusive property of that company. The brands of EYB, BENETEAU, LAGOON and PRESTIGE are listed by SPBI S.A. on the current website with the authorisation of their respective holders. The reproduction, use, imitation, apposition, deletion or modification of these brands without prior authorisation by SPBI S.A. or their holders constitutes the crime of plagiarism, punishable by three years imprisonment and a 300,000€ fine (Intellectual Property Code, article L 716-10). 8.1 The website may contain hypertext links leading to other websites which are wholly independent of the website, www.jeanneau.com. SPBI S.A. does not presume to represent or guarantee the exactness, completeness or truth of information contained in said hypertext links or on any website to which they are linked. Therefore, any access to another website linked to the website, www.jeanneau.com, is undertaken at your own responsibility. 8.2 The creation of any hypertext link to the current website and any referencing of this website are strictly prohibited without express written authorisation by SPBI S.A. Article 9 - Modification of Legal Information on the Website of SPBI S.A.
SPBI S.A. reserves the right to modify or correct, at any time and without prior notice, the current legal information, notably, in the event of a change in the legislation in effect, to reflect compliance with the law. The website, www.jeanneau.com, and the current General Conditions of Use are subject to French law.